Disfruta de la experiencia de recorrer la ciudad del canal en góndola. Diríjase al punto de partida cerca de la parada de vaporetto S. Maria del Giglio en el centro de Venecia. Suba a una elegante góndola negra (hasta 6 personas en su grupo) para comenzar su inolvidable paseo privado en góndola. Deslízate por los románticos canales de Venecia para tener una perspectiva única de los palacios y puentes venecianos. Viaja a través de esta ciudad de libros de cuentos de la manera en que solo los ricos y la nobleza pudieron hacerlo: en góndola. La última persona en tener su propia góndola en Venecia fue Peggy Guggenheim en la década de 1960. Hoy en día, los paseos en góndola están disponibles para cualquier persona. Escucha las amistosas bromas entre gondoleros a medida que pasas de un canal a otro. Experimente Venecia como lo han hecho los venecianos durante más de 1.000 años. The 30 minute ride was more like 20-25 minutes. 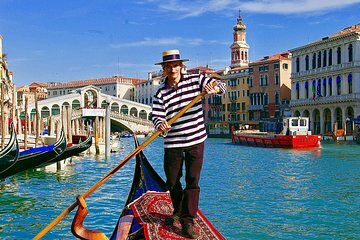 Our gondolier did not say one word to us and the whole thing felt like a ride at Disneyland. I don't blame the tour operator or Viator... the whole gondola ride concept is so touristy. Wish I'd saved my money. Absolute dream come true. Our gondolier was very funny and pointed out interesting buildings along the way. Would definitely do this again. 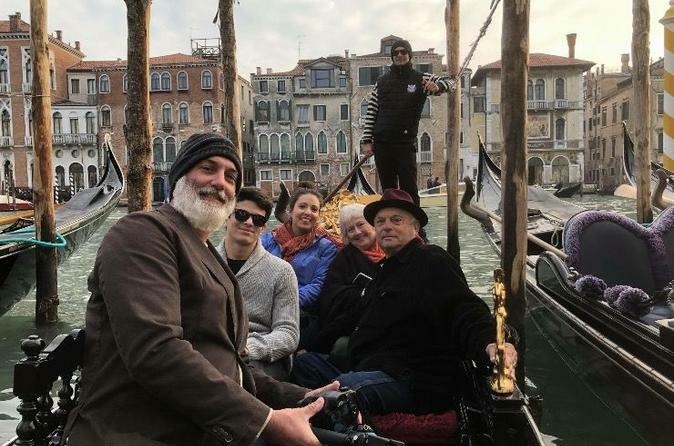 You don't expect your gondolier to have a Mohican haircut, be on his I phone, be wearing phone earplugs and smoke during the trip, all of which he did. You do expect them to greet you, or at least acknowledge you, make you feel that you are going to experience a something special in Venice and say goodbye when you leave, none of which happened. I purchased this trip as a 40th anniversary gift for some special friends, I was embarrassed by the complete lack of any communication, I knew that it was not a narrated tour but I did expect some common courtesy and manners. I did not comment at the time because I did not want to ruin their time in Venice any more than this experience did. A once in a lifetime gift ruined by an individual who was clearly bored the whole time. The 1 star is for the fact that the tour representative was at the meeting place on time . Very enjoyable start to our Venice stay! Enjoyed the ride and the wine! The gondola experience was incredible but I felt as though we over paid. Probably not necessary to pre-pay and book a gondola ride that is only 30 minutes. Our gondolier texted, talked on the mobile phone, and I think even smoked while we were on our 30 min ride. I get it that it's not an amazing experience for him but come on. Very good alternative to the expensive book-while-you're-there tours. It's short, but we used it just to get a feel for the grand canal. The prosecco was also good. They're very short tours, but the description of the location is accurate and is as easy to find as anything else in Venice is. The gondola ride was fine and easy to find the booking leader at the assigned place. I only gave it a 3 stars because while our gondolier, Adriano, was fine, there wasn't much memorable or exceptional about it. It was a loop ride around a bunch of high priced hotels. Little commentary from him and no singing not that I expected it. Classic Venice experience by seeing the sights via Gondola. Fun ride, excellent history, and drinking some Prosecco never hurts. FYI, the Prosecco tasting is two small bottles and two paper cups to drink while you ride, so don't expect anything too fancy there. The Gondola trip was a birthday treat for my wife who has had it on her wish list for a number of years, so from that viewpoint it was perfect. However, it hadn't occurred to us quite how busy it would be, suffice to say that if I'm ever asked what the 'best' traffic jam I've ever sat in then this would win by a country mile. Overall, glad we did it once in our lifetime. Excellent Experience! Short and sweet.